Between contemplative spirituality and biblical Christianity there reside watershed distinctions between first, the definition, and then, the practice of prayer. Simply stated, prayer is talking to God. 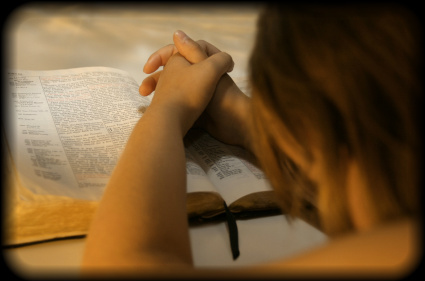 In speaking to God, believers are free to disclose their hearts’ deepest longings and vexations to Him, including their feelings, fears, secrets, sins, praises, petitions, doubts, complaints, thanksgiving, troubles, and more–the prayers of Jesus and the saints in the Bible providing example. Since then we have a great high priest who has passed through the heavens, Jesus the Son of God, let us hold fast our confession. For we do not have a high priest who cannot sympathize with our weaknesses, but One who has been tempted in all things as we are, yet without sin. Let us therefore draw near with confidence to the throne of grace, that we may receive mercy and may find grace to help in time of need(Hebrews 4:14-16). In this manner of praying, the communication that transpires is unmediated. Contemplatives feel themselves to be contacting God directly. There is no need for the advocacy of Jesus Christ, or intercession by the Holy Spirit. The desired communication is soul to Soul, the human with the Divine. But reflect for a moment upon this definition of prayer. Mute means “refraining from speech or utterance.” Language is defined as “communication by voice” with “conventional meanings.” This “mute language” therefore, seems oxymoronic and esoteric. Nevertheless, Foster and other contemplatives promote that to attain higher communion with God, Christians should engage in a form of speech which is no speech. And so I’ve just begun . . . to make a conscious effort to be in a time of prayer and, yes, to speak to him, but then to consciously say, “Okay, I’m done talkin’ now, because I’m just gonna sit here in the stillness and wait to see what it is that you want to say to me”. The question therefore arises, is contemplative prayer, or cultivating “the quiet,” supported in Scripture? Is it a spiritual discipline encouraged in God’s Word? Or, is this manner of prayer simply a device of human invention? We turn to Luke’s Gospel for insight. Even in Jesus’ day the way to pray was controversial. Jesus spoke about prayer to correct the wrong methods and manners of prayer originating from and employed by men. Jesus taught against the publicity with which hypocrites pray and the repetition by which pagans pray (Matthew 6:5, 7-8). So after having heard Jesus pray, and on behalf of the others, one disciple requested, “Lord, teach us to pray just as John also taught his disciples” (Luke 11:1). To the request, Jesus replied, “When you pray, say . . .” (Luke 11:2a). The word to “say” (Greek, lego) means to carry on a logical and cognitive discourse, with the emphasis upon what is being, or is about to be, said. As opposed to silence, to “say” involves thinking and speaking. As is evident from the context and content of His instructions to the disciples, Jesus neither taught nor practiced prayer via mindless and “mute language.” Words are the lego blocks of prayer! Neither can such language be discerned in the prayers of Abraham, Moses, the psalmists, the prophets (i.e., Daniel 9), and Paul. The Bible is filled with speaking, not wordless or mindless, prayers. Regarding his praying, the apostle Paul committed, “I shall pray with the spirit and I shall pray with the mind also” (1 Corinthians 14:15). Think for a moment about the implication of wordless praying. If Jesus or the biblical saints had engaged in the “mute language” of contemplative prayer, there would have been no exemplary prayers recorded in Scripture! The Bible would contain no illustrations of prayer to stimulate and instruct believers in the grace, knowledge, and practice of prayer. [A] close examination of the prayer life of our Lord would seem to indicate that His prayers were definitely petitionary and intercessory in nature. He withdrew from the company of men not in order to extricate Himself from the bonds of the flesh and become one with the Infinite but rather to bring His supplications before God and intercede for His fellow man in agony and sometimes in tears. At length, the words of one of Jesus’ prayers to the Father are recorded in the 17th chapter John’s Gospel. It is not evidenced in Scripture that Jesus Christ ever prayed in a “mute language,” and if, in concert with the Father and the Spirit, He is our Spiritual Director, then why should we? Richard Foster, “What Is Contemplative Prayer?” Be Still (DVD © 2006 Twentieth Fox Home Entertainment LLC). Donald G. Bloesch, The Crisis of Piety (Grand Rapids: William B. Eerdmans Publishing Company, 1968): 109.